Sean McNally first came to BIOS in 2011 as a student in the University of Rhode Island fall semester program. 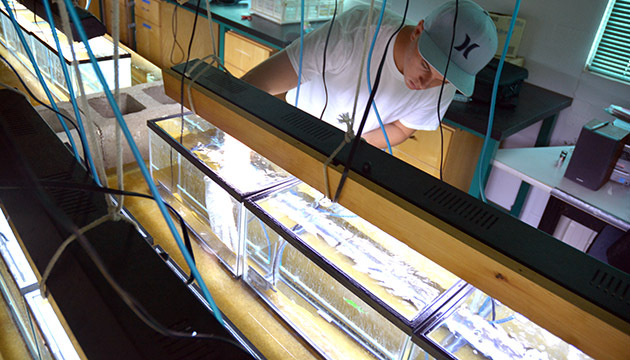 He returned to BIOS as a summer intern in 2012 and again in 2013, to continue his studies of the Sargasso Sea microbial community. BIOS researchers and their colleagues from Woods Hole Oceanographic Institution have refined a common survey method to better account for a marine bacterium known as SAR11. Since BIOS adjunct scientist Steven Giovannoni discovered SAR11 in 1990, scientists have found the Sargasso Sea bacterium is ubiquitous in the world’s oceans and accounts for roughly one in every three cells at the ocean’s surface. These bacteria have power in numbers: each cell contributes to the marine carbon cycle, and with approximately five million bacterial cells inhabiting every tablespoon of seawater, SAR11 is so abundant that its combined weight would outweigh all the fish in the ocean. However, BIOS microbial oceanographer Rachel Parsons and intern Sean McNally discovered that SAR11 was surprisingly rare when they used a popular method of assessing total bacterial diversity that analyzes hypervariable regions of DNA. Short, hypervariable regions of DNA are rapidly evolving sequences within bacterial genomes that provide a unique molecular “fingerprint” for each bacterial species. SAR11 was abundant in samples analyzed by microscopy, but the “fingerprint” was conspicuously less abundant when the same samples were analyzed in a hypervariable DNA sequencing project. 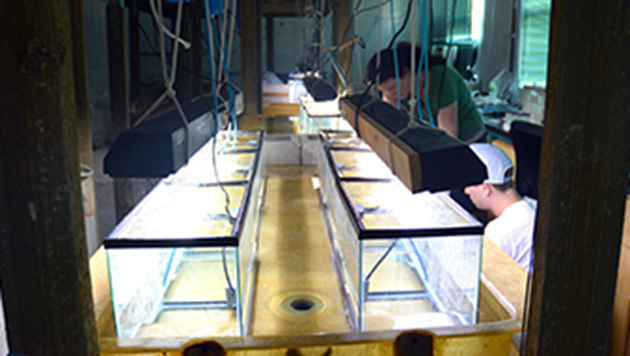 Using tanks set up in the lab, BIOS scientist Rachel Parsons and intern Sean McNally study how corals influence microbial communities. McNally’s microscopy documented abundant SAR11 cells in tank seawater, but SAR11 DNA was less frequently detected in DNA analyses of the same water. This led Woods Hole Oceanographic Institution scientist (and former BIOS intern) Amy Apprill to question the efficacy of the method, and tweak it to improve SAR11 detection. Hypervariable region “fingerprints” are pulled from all bacteria in a sample by extracting the genomic DNA from every cell, heating the DNA so that the double-helix unwinds into two strands, and mixing in short sequences of DNA known as “primers.” These primers are designed to match and attach to a section just upstream of the hypervariable region on a single strand of DNA. Once attached, primers initiate the recruitment of chemical compounds to create a new, short strand of DNA that matches the hypervariable region. At the end of the process, the short hypervariable region copies are sequenced and compared to a reference database to identify which bacteria were initially present in the sample. The relative abundance of each hypervariable region copy should reflect the number of organisms initially present in the sample. Parsons and her colleagues suspected the underestimation of SAR11 with this method was related to the primers being used. The primers are designed to match a sequence shared by all bacteria preceding the hypervariable region, but if the primers don't match all bacterium sequences, some bacterium will be poorly represented in the final dataset. For example, if SAR11 was ten times more abundant than another species of bacteria in the sample, roughly ten times as many copies of the SAR11 hypervariable DNA should show up in the sequencing dataset. In their dataset, fewer SAR11 copies were showing up compared to known cell counts. Further analysis proved that the established primers, which worked well with other bacteria, had a small mismatch with SAR11. Their colleagues Amy Apprill and Laura Weber from Woods Hole Oceanographic Institution, redesigned and tested the primers to ensure a better SAR11 match and subsequently generate representative data from environmental samples. While no primer set is perfect, the new set provides a clearer view of bacteria that dominate aquatic environments. Their results were published in the June issue of the scientific journal Aquatic Microbial Ecology, and the new primers are already being incorporated into global studies of bacterial diversity.